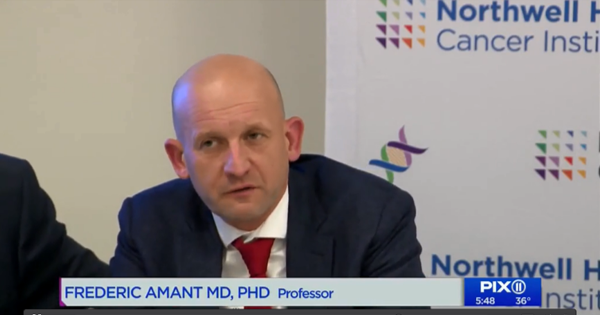 On November 13th, Dr. Frédéric Amant was invited to Northwell Health by Dr. Richard Barakat, chief and director of cancer at New York State’s largest health care provider. Northwell consists of 22 hospitals, delivering 40,000 babies a year (1% of total in US). They see a significant number of young pregnant women with cancer, so they opened a specialized centre in the treatment of pregnant women with cancer: the Center for Cancer, Pregnancy and Reproduction. Frédéric Amant was invited to New York to share his experience and the results achieved with the International Network on Cancer, Infertility and Pregnancy and with his research team on Cancer in Pregnancy in Belgium (Leuven) and the Netherlands (Amsterdam). Several news channels have reported on the opening of this specialized center. All media coverage (including an interview with one of the patients, Dr. Barakat and Dr. Amant) can be found on the media page of Northwell Health.